By Khuram S. Kazmi, M.D., Jason P. Shames, M.D. Sinonasal inflammatory disease is extremely common, with nearly all individuals experiencing symptoms at some point due to infection, allergy or other causes. 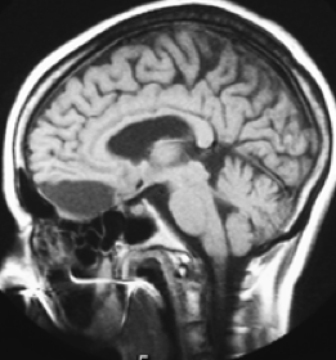 The vast majority of people do not require imaging, but those who do are often unresponsive to medical therapy or may have repeated episodes of sinusitis, or chronic sinusitis. 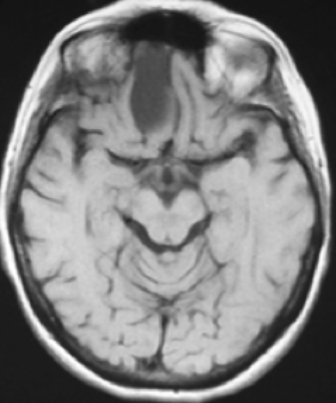 Other reasons to image include an abnormal physical exam, such as the presence of a polyp or other mass, or an underlying condition that predisposes one to sinusitis, such as an immunocompromised state.1 Patients who have known or suspected sinusitis, and signs or symptoms that suggest a complication such as intracranial abscess or orbital cellulitis, may undergo imaging of the suspected site. In addition, patients planning for surgical intervention typically undergo preoperative imaging. While occasionally ordered by referring physicians, radiographs are limited in their depiction of sinonasal disease processes. 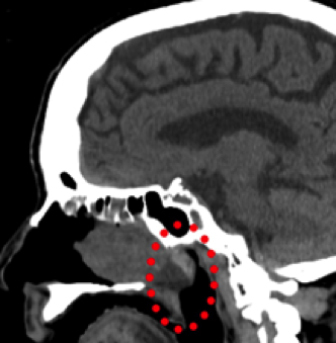 Computed tomography (CT) is the workhorse modality in paranasal imaging. 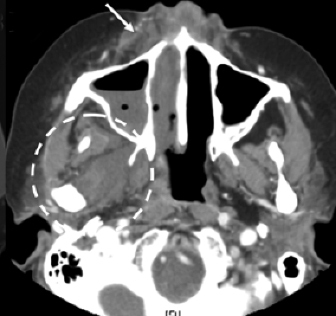 In the past, single-detector CT required patients to be imaged twice – once axially in the supine position and then coronally in the prone position with the neck extended. 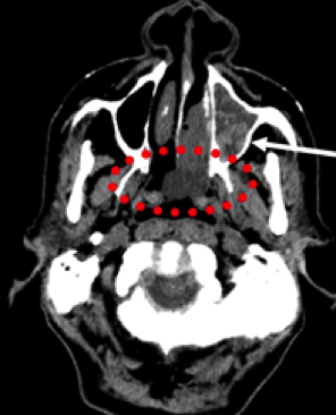 While this technique could determine the mobility of intrasinus material, it was uncomfortable for patients and was susceptible to significant streak artifact from dental hardware. 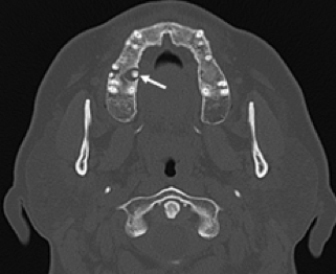 Modern-day multidetector CT allows for patients to be scanned more rapidly in the supine position and then have the images reconstructed in the sagittal and coronal planes, which minimizes dental artifact. However, this makes assessment for air fluid levels and mobility of secretions more difficult. 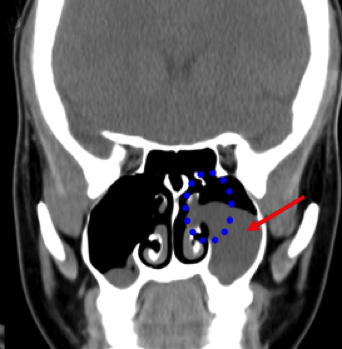 The posterior sinuses drain into the superior meatus through the sphenoethmoidal recesses (Figure 2). The naso- lacrimal duct is the only passage that drains into the inferior meatus. 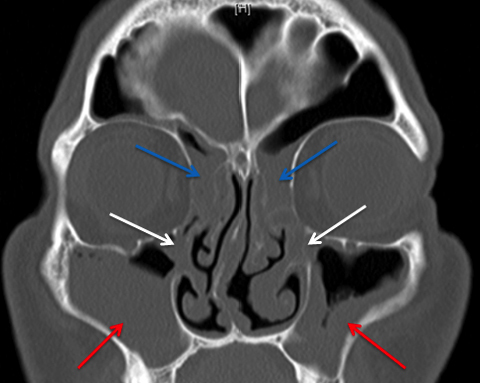 Additional bony structures important to sinonasal anatomy include the fovea ethmoidalis, lateral lamella, cribriform plate, crista galli, perpendicular plate, nasal septum, lamina papyracea, and the nasal turbinates (Figure 5). The fovea ethmoidalis represents the bony roof of the ethmoid air cells. It connects to the cribriform plate via the lateral lamella. 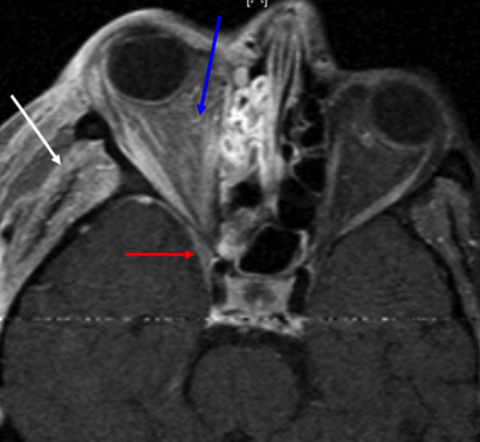 The crista galli protrudes superiorly in the midline from the cribriform plate. 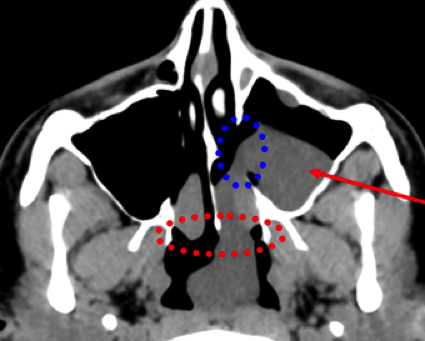 Along its inferior aspect, the cribriform plate connects with a thin vertically oriented bone, known as the perpendicular plate, which connects inferiorly to the nasal septum. 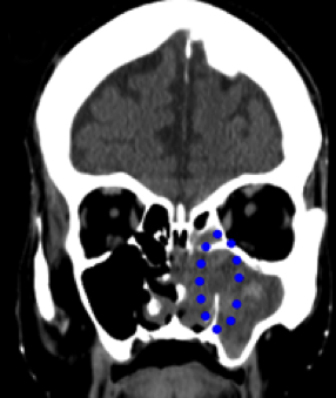 Within the nasal cavity are the turbinates — superior, middle and inferior, in ascending order of size. 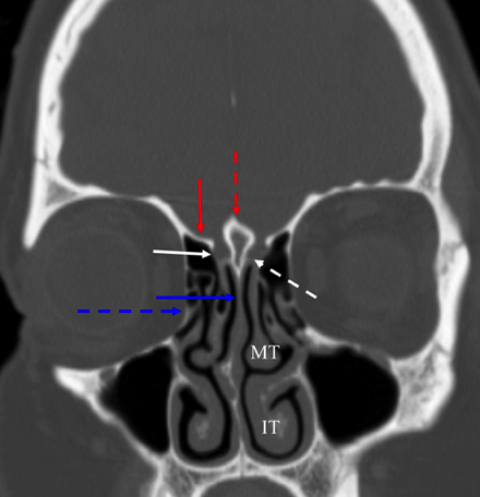 The lamina papyracea is quite thin and represents the lateral border of the ethmoid sinuses and medial wall of the orbit. 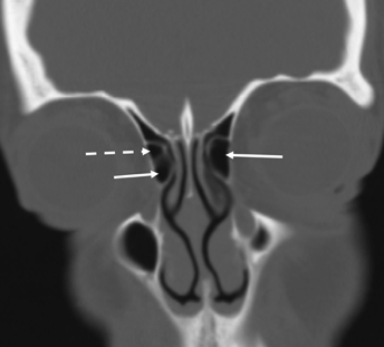 Several variants of the paranasal sinuses are of primary importance in surgical planning. Also important, but less so, is that they can increase the likelihood of developing sinus disease. Ethmoid air cell variants include a prominent agger nasi cell, type I-IV frontal cells, prominent ethmoid bullae, Haller cell, and Onodi cell. 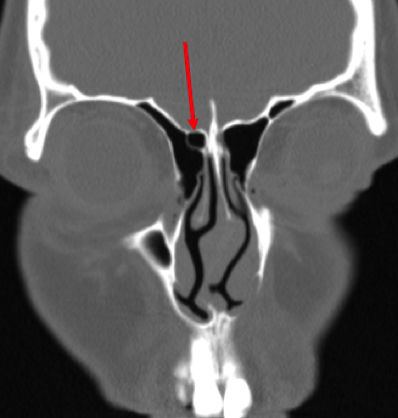 A common variant of the middle turbinate is called a concha bullosa, which describes pneumatization and enlargement of the middle turbinate. Pneumatization of various bony structures can be seen, including the crista galli, pterygoid processes and clivus. 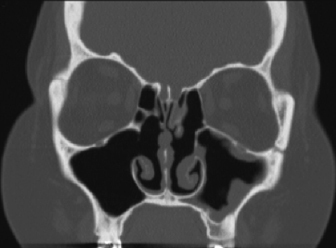 Deviation of the nasal septum is extremely common and may be considered an anatomic variation as well. 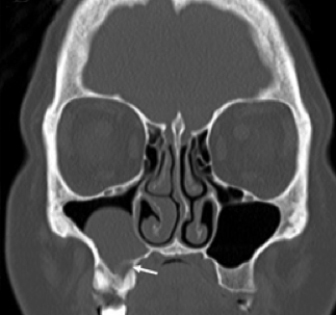 It can predispose one to nasal and OMU obstruction, and sinusitis and can be exacerbated by an osseous spur. 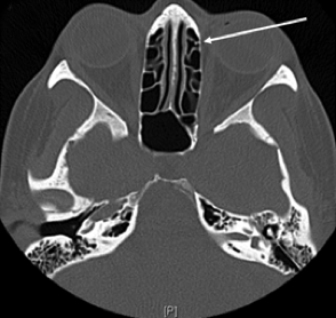 Common benign paranasal sinus pathologies include inflammatory mucosal disease, mucocele, osteoma, noninvasive fungal sinusitis (allergic or mycetoma), mucous retention cysts, and polyps. 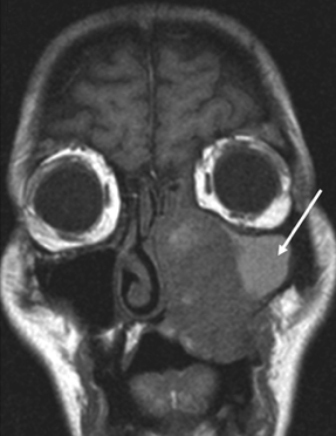 Inflammatory mucosal disease, which simply describes sinus mucosal thickening, is seen in both asymptomatic patients and those with acute sinusitis (Figure 9). In the absence of adequate clinical history, differentiating between the two can be difficult. Certain coexisting findings, such as the presence of air-fluid levels, tend to favor an acute process. However, this finding is nonspecific and may also be seen in other circumstances, such as nasogastric tube insertion and prolonged supine positioning.3 Mucosal thickening can also affect the nasal turbinates, often asymmetrically. Usually this occurs in a normal cyclical pattern, although nasal obstruction can result depending on the degree of thickening. 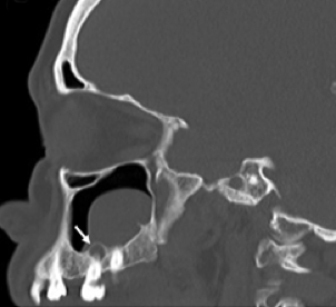 Complications of sinonasal inflammatory disease include bony wall thickening or osteitis from chronic inflammation (Figure 11), mucocele formation, or orbital or intracranial involvement (Figure 12). 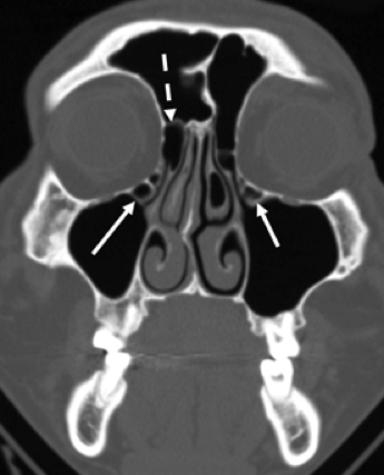 A mucocele is an obstructed and dilated mucus-filled sinus (Figure 13). 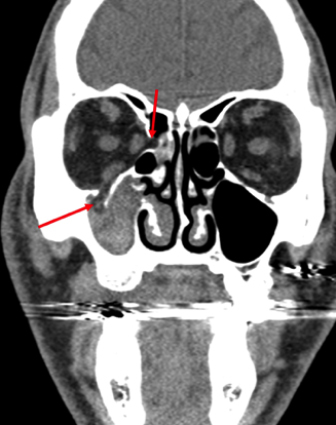 While it can occur in any sinus, the frontal sinus is most common.3 Surgical intervention is usually required. Mucous retention cysts, or dilated secretory glands, appear as round, dome-shaped, soft-tissue densities in the maxillary sinus that are typically found incidentally, similar to polyps. They are less common in the other sinuses and typically do not require additional workup or follow-up.9 Polyps, on the other hand, may become more extensive and problematic, leading to obstruction and osseous remodeling. 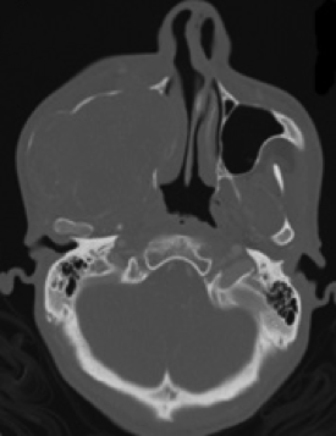 The presence of diffuse sinus and nasal cavity opacification leads one to consider sinonasal polyposis. Infundibular enlargement is almost always present.10 The opacification typically represents a combination of the polyps and the resultant obstructive inflammation (Figures 14 and 15). 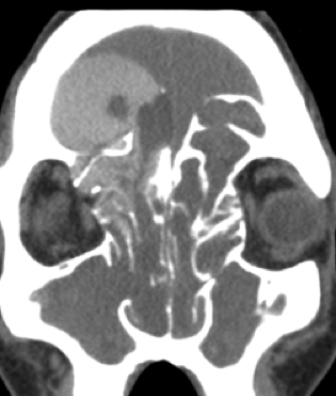 Other aggressive paranasal sinus pathologies include invasive fungal sinusitis, Wegener’s granulomatosis and neoplasms. 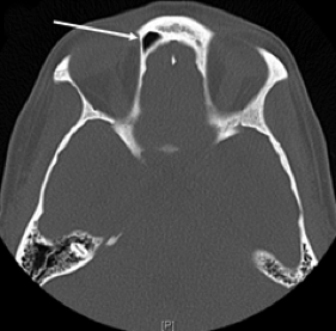 These are seen as soft-tissue densities within the paranasal sinuses, causing bony destruction. 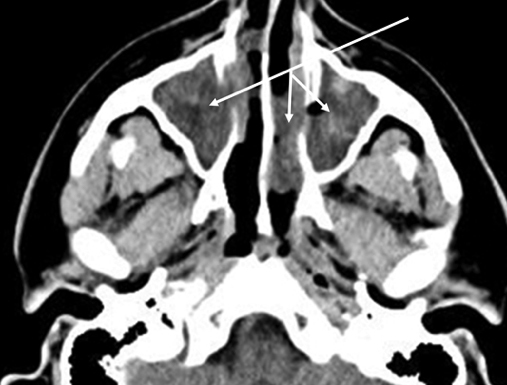 Invasive fungal sinusitis (Figures 19 and 20) is an aggressive infection in immunocompromised patients that will typically involve the adjacent paranasal soft tissues, orbits and even extend intracranially. 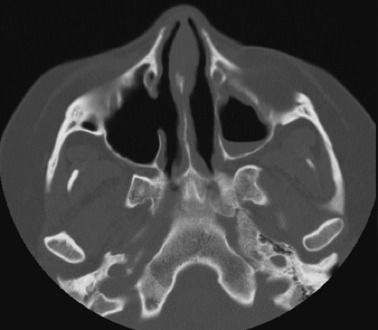 At times, invasive fungal sinusitis may develop too quickly to destroy bone. Wegener’s granulomatosis is an idiopathic necrotizing granulomatous vasculitis. Early on it appears as nonspecific sinonasal inflammation. As the disease progresses, there is often bony destruction, first involving the nasal septum (Figure 21).3 There is often simultaneous involvement of the lower respiratory tract, kidneys, skin and joints, so history is critical. Neoplasms commonly seen in the sinonasal cavities include squamous cell carcinoma (Figure 22), lymphoma, sarcoma (Figure 23), salivary gland tumors and metastases. Squamous cell carcinoma is the most common sinonasal malignancy. 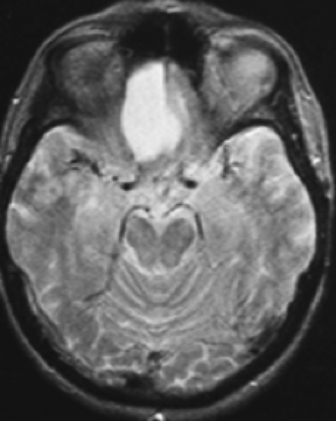 It is more common in men over 60, and the majority of cases occur in patients with a history of tobacco use.13 On MRI, squamous cell carcinoma enhances following contrast administration and typically demonstrates bony destruction. 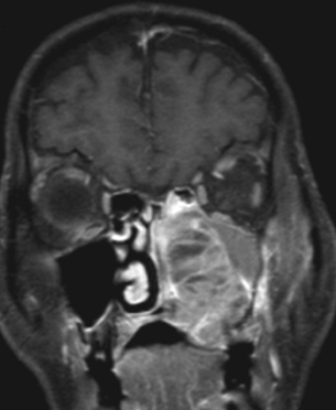 No reliable imaging features differentiate it from inverted papilloma or the other sinonasal neoplasms. Two types of surgery have traditionally been used to treat sinonasal inflammatory disease. The older method is the Caldwell Luc procedure, which requires an approach through the anterior maxillary sinus wall. The mucosa of the maxillary sinus is then stripped in its entirety. A drainage pathway is then created for maxillary sinus contents through the lateral wall of the nasal cavity into the inferior meatus. 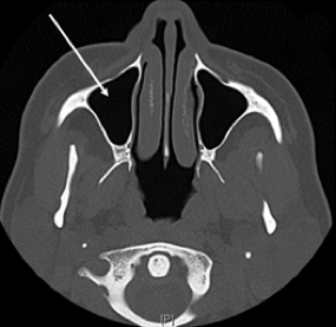 On CT, common findings after a Caldwell Luc include anterior and medial wall bony defect (Figure 21), osseous wall thickening, and collapse of affected maxillary sinus.14 Due to complication rates and the radical nature of the procedure, FESS was developed. First performed in the United States in the mid-1980s, FESS has supplanted Caldwell Luc as the preferred surgical method to treat sinonasal inflammatory disease. It involves the placement of an endoscope through the nasal passages and removal of the sinus walls and septations to open/create drainage pathways for inflammatory/infectious debris (Figure 24). 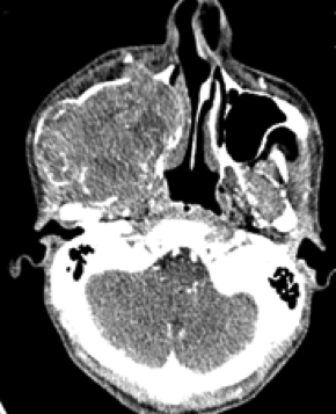 Surgical planning CT studies are often used for guidance, making it important to delineate the anatomic variants described above. 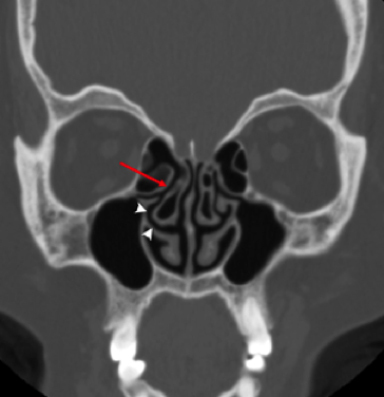 Fractures of the sinus walls most commonly involve the maxillary and ethmoid sinuses. Orbital blowout fractures are the result of blunt trauma to the orbit. 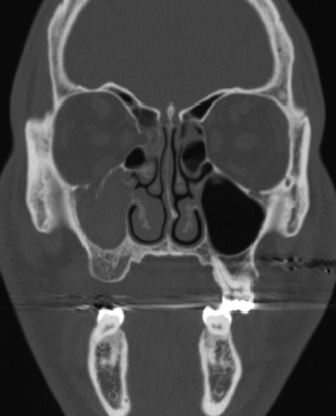 Due to weakness caused by the presence of the infraorbital canal, these fractures can go through the orbital floor into the maxillary sinus. 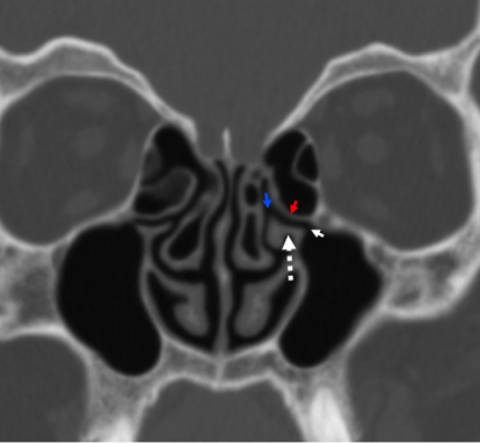 The medial orbital wall or lamina papyracea is also a weak point, allowing fracture into the ethmoid air cells (Figure 25). 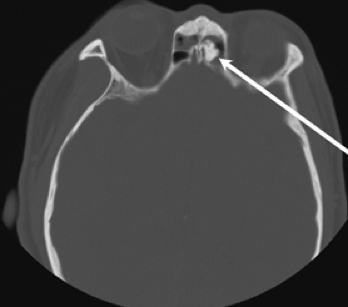 In both cases, there is a risk of extraocular muscle herniation through the fracture defect with or without muscle entrapment, resulting in muscle dysfunction and diplopia.3 Fractures through the lateral wall of the maxillary sinus often occur as part of a zygomaticomaxillary complex or tripod fracture (Figure 26). 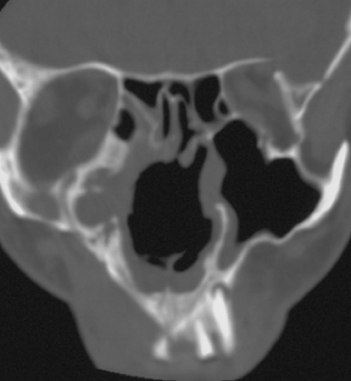 The lateral orbital wall and zygomatic arch are also typically involved in this fracture complex. 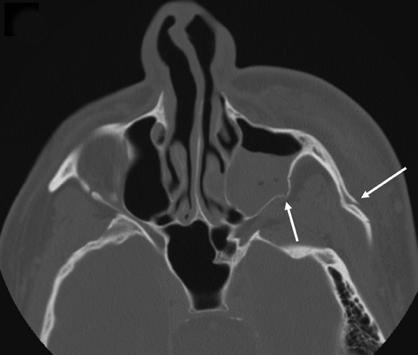 Evaluation of the paranasal sinuses requires detailed knowledge of the anatomy and common anatomic variants. The anatomic variants are not only important in that they predispose one to sinus inflammatory disease, they are important for surgical mapping. 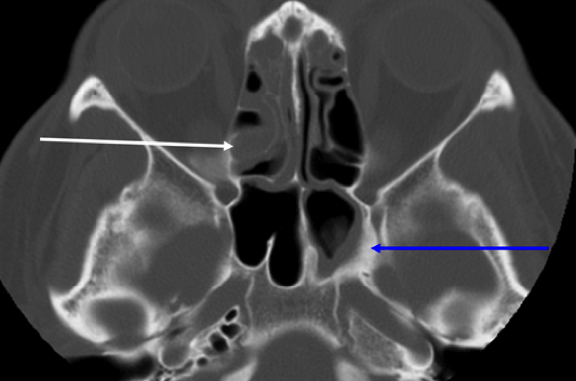 While it may be difficult to differentiate asymptomatic sinus opacification from acute sinusitis without a clinical history, imaging can greatly aid in directing the course of treatment for sinusitis by unmasking alternative causes such as obstructing lesions or odontogenic sources. 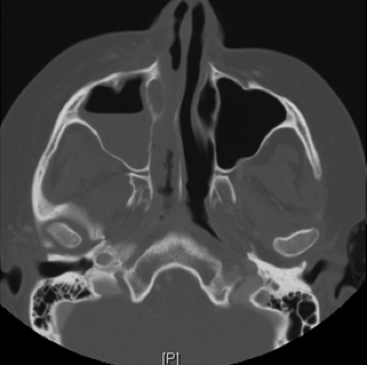 Imaging is also important in delineating complications of sinusitis, such as orbital or intracranial involvement. 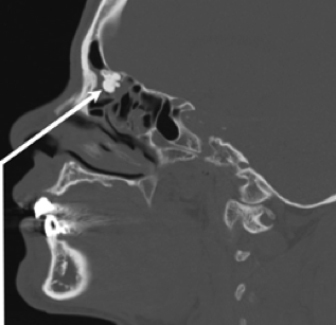 Finally, benign and aggressive sinonasal masses, postsurgical changes, and post-traumatic injuries can be readily recognized based on their characteristic patterns. Cornelius RS, Martin J, Wippold FJ, et al. ACR appropriateness criteria sinonasal disease. J Am Coll Radiol 2013;10(4):241-246. Harnsberger R. Handbook of head and neck imaging. 2nd edition. St Louis, MO: Mosby; 1995:340-395. Som P, Shugar, J, Brandwein, M. Sinonasal cavities. In: Som P, Curtin H. Head and Neck Imaging, 4th edition. St Louis, MO: Mosby; 2003:1-438. Tuncyurek O, Songu M, Adibelli ZH, et al. Frontal infundibular cells: pathway to the frontal sinus. Ear Nose Throat J 2012;91(3):E29-32. 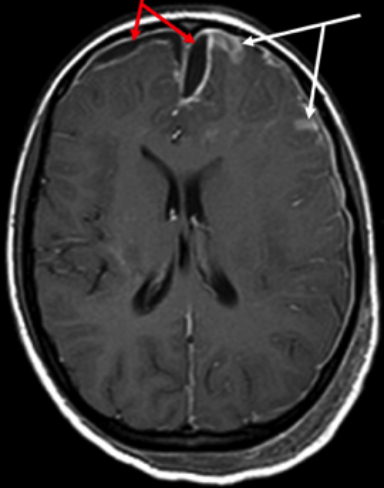 Hedlund G. Congenital frontonasal masses: developmental anatomy, malformations, and MR imaging. Pediatr Radiol 2006;36(7):647-662. 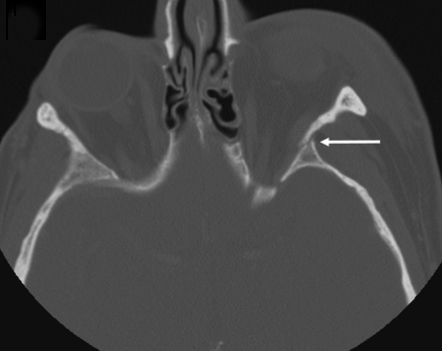 Mehra P, Murad, H. Maxillary sinus disease of odontogenic origin. Otolaryngol Clin North Am 2004;37(2): 347-364. Fatterpekar GM, Delman BN, Som PM. 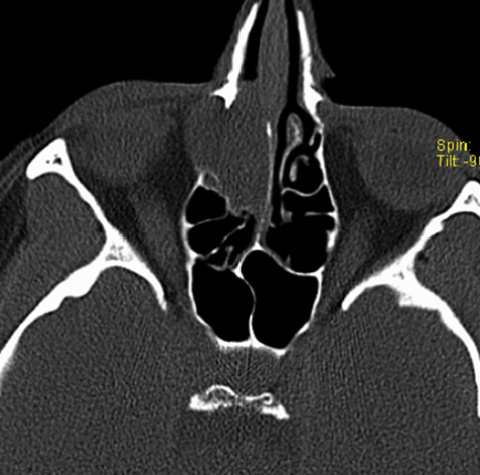 Imaging the paranasal sinuses. Anat Rec 2008;291(11):1564-1572. Strek P, Zagólski O, Składzień J, et al. Osteomas of the paranasal sinuses. Med Sci Monit 2007;13(5): CR244-250. Wang, JH, Jang YJ, Lee BJ. 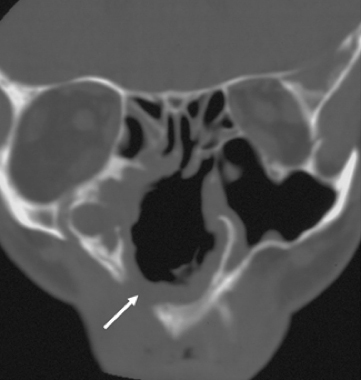 Natural course of retention cysts of the maxillary sinus: long-term follow-up results. Laryngoscope 2007;117(2):341-344. Drutman J, Babbel RW, Harnsberger HR, et al. 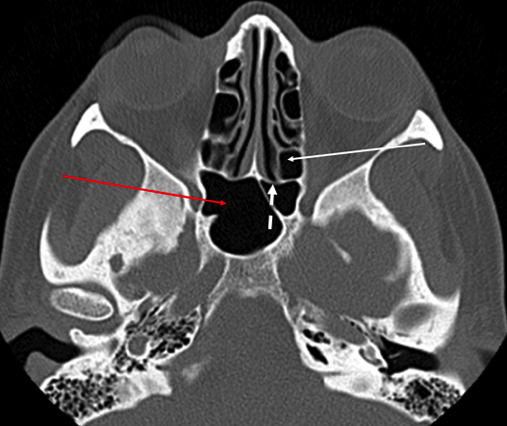 Sinonasal polyposis. Semin Ultrasound CT MR 1991;12(6):561-574. Majithia A, Tatla T, Sandhu G, et al. 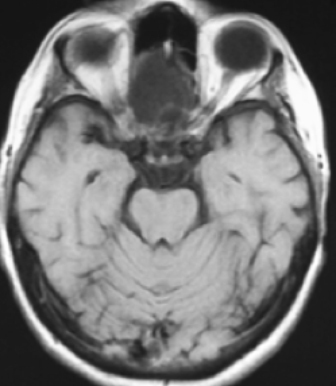 Intracranial polyps in patients with Samter’s triad. Am J Rhinol 2007;21(1):59-63. Mendenhall WM, Hinerman RW, Malyapa RS, et al. 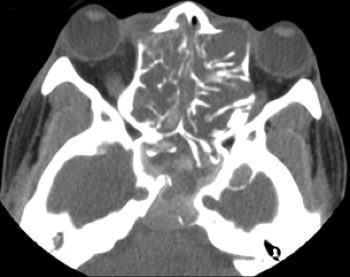 Inverted papilloma of the nasal cavity and paranasal sinuses. Am J Clin Oncol 2007;30(5):560-563. Michel J, Fakhry N, Mancini J, et al. Sinonasal squamous cell carcinomas: clinical outcomes and predictive factors. Int J Oral Maxillofac Surg 2014; 43(1):1-6. Nemec SF, Peloschek P, Koelblinger C, et al. 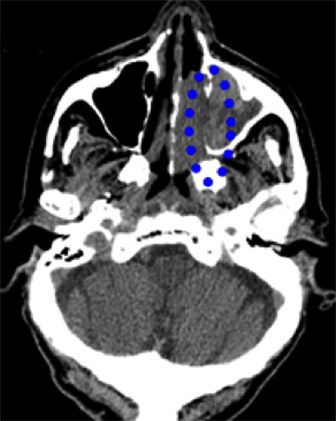 Sinonasal imaging after Caldwell-Luc surgery: MDCT findings of an abandoned procedure in times of functional endoscopic sinus surgery. Eur J Radiol 2009;70(1):31-34. York G, Barboriak D, Petrella J, et al. 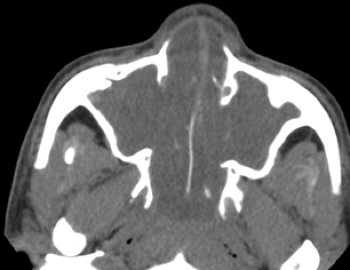 Association of internal carotid artery injury with carotid canal fractures in patients with head trauma. AJR Am J Roentgenol 2005;184(5):1672-1678. Kazmi KS, Shames JP. 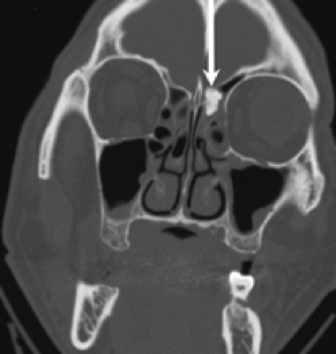 Imaging of the Paranasal Sinuses. J Am Osteopath Coll Radiol. 2015;20(7):27. Khuram S. Kazmi, M.D., Jason P. Shames, M.D.